Influence, our automated peer support engine, strategically connects students with powerful peer stories on the topic of your choice. An event—such as exam week—triggers Influence to send interventions. The Influence social learning engine matches students with the most impactful story for them. Your students see these powerful stories wherever they are, delivered on mobile or desktop—no login required. Prevent setbacks before they occur. Right before common stress points, like midterms, class registration, and finals, we guide students toward the right course of action to avoid poor outcomes. Personalized messages from trusted peers. Our algorithm micro-targets stories based on each student's individual characteristics and preferences, so they always hear from a relatable peer. Powerful peer support at scale. Influence amplifies each student’s success story by sharing it with students who need to hear it, creating a ripple effect that supplements limited faculty and advising resources. Increase usage of your existing resources. Let students hear about the value of your school’s tutoring center, advising center, or financial aid office from the people they trust most—their peers. Get the big picture. Identify major trends as they are happening with a dashboard view of the shape and direction of student behaviors. Discover what motivates each unique population. 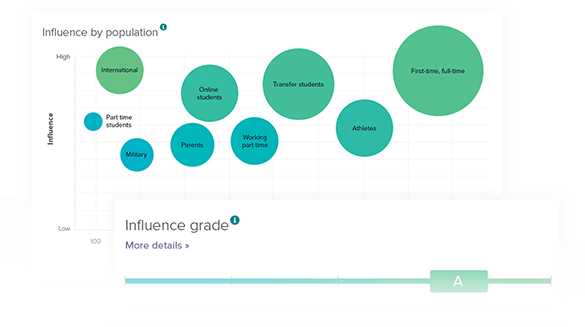 Our analytics identify the most influential content for distinct student populations—so our algorithm and our clients are always learning and refining.